The Erasmus+ programme funds you to study at one of our partner universities in Europe. 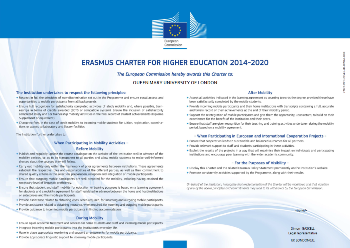 Queen Mary has Erasmus+ exchange agreements with almost 100 leading universities across Europe. Erasmus+ is the EU’s highly regarded flagship exchange programme for students, lecturers and staff (It is the largest educational exchange programme in the world.). The programme has been running since 1987 and over three million European students have participated in it. Watch our interview with David who studied abroad at Bocconi University in Milan on the Erasmus+ Programme. The Erasmus+ exchange programme enables you to spend a semester or a year at one of our Erasmus+ partner institutions. Read more about Erasmus+ study placements. As a first-year student you can spend your second year (or the first semester of your second year) abroad. Some of Queen Mary’s four-year degree programmes (e.g. Law, SLLF) enable you to spend your third year abroad and come back to Queen Mary for your fourth year. If your degree includes a work placement or a year in industry), you can also benefit from the programme. Read more about Erasmus+ traineeships. Your Erasmus+ period abroad will count towards your Queen Mary degree. The programme also gives you a generous grant to study in Europe. There is additional financial support for disadvantaged students. Your school or department are central to the Erasmus+ programme: where you can go depends on the exchange agreements your department has with other European universities. Places on this long-established and prestigious scheme are also allocated by your school or department. Each academic school also has a dedicated Erasmus+ Coordinator who will guide you through the application process and approve your module choices. They are your key Erasmus+ contact. Find out who your Erasmus+ Coordinator is. All eligible Erasmus+ students also receive a grant to help towards the costs of moving to another country and living abrod. Want to speak to a Student Ambassador about their experience abroad on Erasmus+? This project has been funded with support from the European Commission (EC). The content of these web pages is the sole responsibility of Queen Mary University of London. The EC cannot be held responsible for any use that may be made of the information contained in these pages.